Bleach 542 is expected to be released by Tuesday or Wednesday of the third week of June. In this chapter we will witness Ichigo’s real zanpakuto, the real Zangestu. Ichigo’s quincy soul was suppressing his powers all this time. As a result, he was not able to fully harness his Hollow/Shinigami powers. But now that his Quincy side decided to step back and allow Ichigo to become a full pledge Shinigami, he can now use 100% of his powers. Find out what will Ichigo’s real Zangestu will look like in Bleach 542. Meanwhile check out my Bleach chapter 542 predictions/spoilers below. UPDATE: Bleach 542 was recently released. Bleach chapter 542 is entitled “The Blade is Me”. Ichigo is finally reunited with his real Zanpakuto after his Quincy side decided to step back. Ichigo has now two swords! He’s a dual fielder now. Find out more and read this exciting chapter. This is the moment we have been waiting for Bleach fans. Things are getting really exciting now that Ichigo will have a new Zanpakuto, or rather his real Zanpakuto. In the other world, the so-called old man Zangestu (his quincy soul) decided to step back and release Ichigo’s full Shinigami powers. 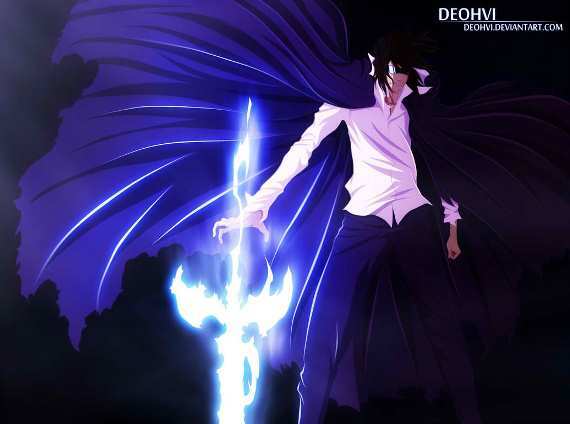 He also showed Ichigo his real zanpakuto – Zangestu. This means, there’s no new name and no new type of power. It’s just the same Zangestu, most probably the blade will have different shape or look (probably white), and definitely more powerful than ever. I’m very excited how will the new Bankai form will look like. Most probably it will be the same speed type power, since his Hollow or Asauchi has that kind of power from the beginning. But I am hoping that Ichigo will have some new moves or powers other than the Gestuga Tenshou. Well, that’s what going on inside Ichigo, whereas on the outside, Nimaiya is almost finished forging Ichigo’s new Zanpakuto. And according to Nimaiya it’s white. After Ichigo getting his real zanpakuto, probably he will have to train with his newly released powers to get familiar with, before facing Juha Bach. Let’s just wait and see in the next chapter. Probably the next chapter will be entitled “The Blade and Me 3“. Bleach 542 spoiler will be posted in this section if ever a confirmed bleach 542 spoiler leaks out or if someone contributed one. Stay tune as I will update this post once a spoiler comes out or when Bleach 542 is released. And probably do a review for the next chapter.